Journey into the world of biology with engaging graphics that help students visualize concepts and real-world examples that relate biology to their everyday lives. The exclusive use of Foldables provides a unique study approach. The large variety of lab options and seamless integration of technology enhances your learning environment. Enhance reading, writing, and study skills with Foldables™. Foldables are unique student-made, thee-dimensional graphic organizers that help students organize and review key information. Excite students about investigating their world—safe and easy-to-do MiniLabs reference key concepts, BioLabs offer a variety of classical structure labs, and dynamic open-ended activities allow students to think and perform like scientists. Provide ongoing opportunities for student self-assessment. Reading Checks, found throughout the narrative, challenge students to summarize, apply, and/or explain the important concepts in their reading. Enlighten, extend, and enrich your students’ understanding with a host of student-centered features. Many features have special links on the Glencoe Web site to provide additional related information and assessment. Biotechnology - These cutting edge articles (8) focus on the molecular aspects of biology. From vaccines to the human growth hormones, students will be engaged to do a critical thinking exercise upon completion. Plus, they will be encouraged to go the web site at: bdol.glencoe.com/technology to find out more about the topic. Word Origins – these margin features provide root word origins of key biology terms. This can be very beneficial to all students; especially ELL students. This element supports the strong reading strand of the text. Connections - These are specific designed to connect biology across the curriculum. 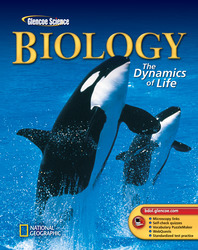 Students learn how biology is connected to art, literature, and other subjects; especially to physical science.